The EASY way to find a LOCAL Breeder!!! Welcome to Lovcat, where cats are our passion! We specialize in silver and golden persians - we believe that Persians are the most beautiful, elegant, and attractive breed of cats. We love our cats and kittens, but it certainly wouldn't be fair to keep them only to ourselves. If you see a kitten that you just absolutely love on our website, please contact us, and we'll see what we can do to match you up! Healthy, Happy, Home-raised fluff balls looking for new hearts to steal! We generally have pure white kittens available, as well as a few beautiful tabbies and calicos. We have both show and companion kittens available. We are a FeLV/FIV/PKD free cattery. 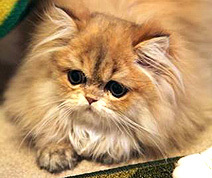 Our kittens are PURE PERSIAN- no CPC or Himalyan. You will be impressed with their size and sweet personalities. All kittens have good health guarantees and come with comprehensive gift basket. Shipping available at buyers expense, home visits encouraged! 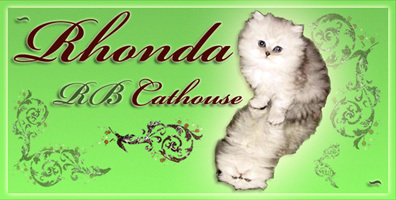 We are a small cageless Cattery registered with CFA/TICA, specializing in Chinchilla/Shaded Golden and Odd/Blue Eyed Bi-color in Exotic Shorthair and Persians with occasionally Color-points (Himalayan)..... We are working with some of the best lines that are PKD Tested Negative by DNA. Babies are raised underfoot in our home, treated as family members and sleeps in the bed with us. I do my best to provide my cats and kittens with the best life possible. 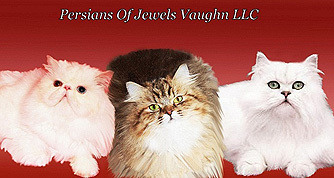 Welcome to Persians Of Jewels Vaughn Cattery. POJV is a CFA Registered Cattery and a 2009 , 2010 , 2011 & 2012 CFA Cattery Of Excellence! 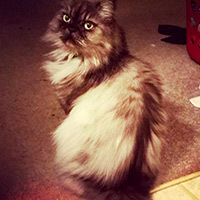 POJV Cattery specializes in the breed of Persian/Himalayan pedigree cats. We offer a variety of colors, Silver, Golden, Solids, Tabby, Chocolate, Lilac and (Bi Color ) & Color Points. In our Solid Whites we produce Odd, Blue, Green and Copper Eyed Kittens. Personality Plus, Pet, Show. Reasonable Prices! 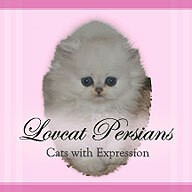 POJV Persians raised in the home !. We have grands GC, CH, NW, GRC & DM bloodlines. Our babies are raised underfoot and handled daily for sweet loving personalities. Our babies come to you pre spoiled. We are a small cage less cattery and We are Veterinarian checked and Approved Cattery. We provide a written health guarantee. Please stop by to see our beautiful cats. We are a Feline Leukemia, FIV, Ringworm and PKD Negative Cattery Cattery will deliver up to 100 miles of the London Kentucky area with a no fuel charge. POJV offers shipping Via United Airlines ( Pet Safe Program ) out of the Louisville, Kentucky Regional Airport at new parents cost. We hope that you enjoyed your visit @ POJV Cattery. Exceptional Silver and Golden kittens with timeless beauty and grace. Perfect little "Baby Doll" faces and playful, affectionate personalities make these kittens one of the most desired breeds anywhere. We are a small professional CFA registered "Cattery of Excellence" proud to offer the elegance of Silver and Golden Persians kittens. All kittens come health guaranteed with a written sales agreement. Kittens are pampered with the very best from the moment of their arrival here til the day they arrive to you. Each kitten is loved and cuddled with full one on one attention to ensure an easy transition into their new forever home. We strive to maintain and exceed the standards set for this breed by the CFA and are pleased to offer several references upon request. 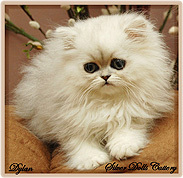 * We promote the traditional Dollface Persians & Himalayans ^..^ Come see what's new, visit our website today!!! ~Silver Dolls Cattery~ "Where Health and Natural Beauty Set Our Standards"
CFA Cattery of Excellence 2007, Home raised full of fun Baby Doll Persians. Most are lap kittens but not guaranteed to be. Handled and spoiled rotten before leaving at 10 weeks or so. Health Guarantee, ringworm, flea, felv, parasite, ear mites etc free. Parents have been PKD scanned or genetic tested Negative. Looking for loving homes for adults with habits & expectations available.